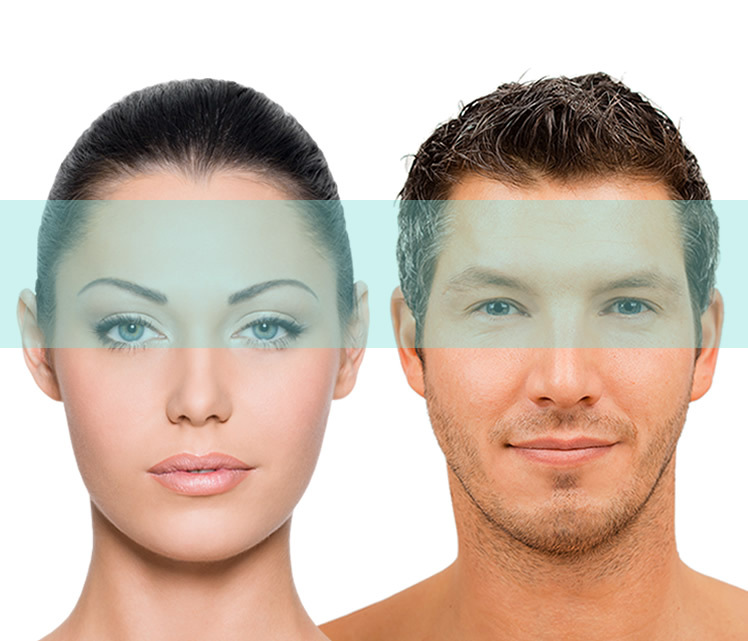 Many patients come to Dr. Lattman wanting to improve the appearance of their upper eyelids and brow area. Often, an upper eyelid blepharopalsty can correct the problem. But in some patients, a low brow also contributes to the hooded and heavy appearance appearance of the upper eyelids. Dr. Lattman uses the endoscopic browlift technique to treat droopy eyebrows, and heavy upper lids in patients with low brows. As you get older, the brow and forehead begins to drop. Sun exposure, gravity and frowning all lead to frown lines, wrinkles across the forehead, and increased heaviness of the eyebrows and upper eyelids. These changes contribute to a tired, angry or sad expression that often does not reflect the way you feel. Dr. Lattman takes great care to evaluate the brow, and to reposition it in a natural position, so that the results are completely natural looking and not overdone. Dr. Lattman performs brow lifts with minimal incisions hidden in the hair using surgical telescopes known as endoscopes. This state-of-the-art method provides a natural appearance, minimal incisions, and a quicker recovery. A brow lift is often performed along with other cosmetic surgery procedures to achieve a balanced and natural look. For instance, Dr. Lattman routinely combines an endoscopic brow lift with blepharoplasty, and laser skin resurfacing. 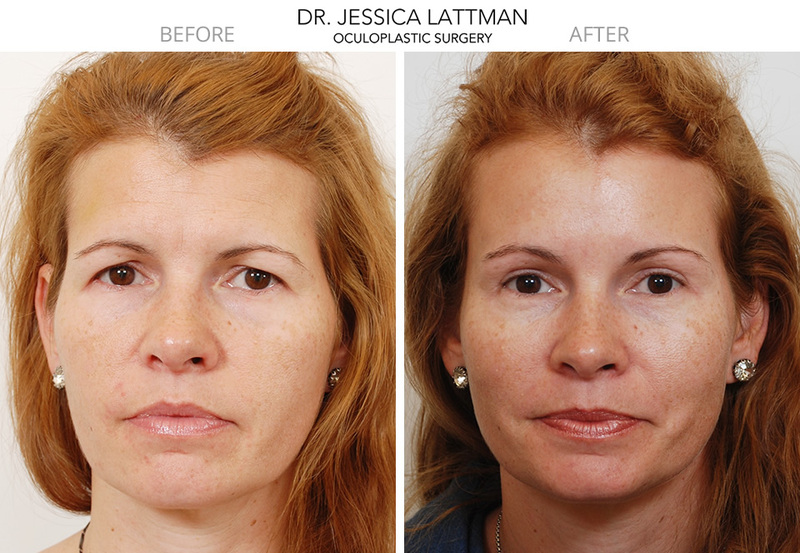 The endoscopic brow lift is done at Dr. Lattman’s surgical facility. After you arrive at the facility, Dr. Lattman will mark her incisions and answer any last minute questions. The surgery takes about 40 minutes and can be done either with light sedation or general anesthesia. You will have a small pressure bandage around your forehead which is removed the next morning. The beauty of the endoscopic approach, is that all the incisions are hidden behind the hairline. So there are no visible signs of surgery on your face. Most patients go back to normal activities in a few days. Heavy lifting and exercise can be started after 2 weeks. A: You will have some bruising and swelling, but this should be minimal. The average patient takes a few days off from work. You will wear a pressure dressing around your forehead for one night. Most people have minimal pain for a day or two. Q: What is the average age of people who have this surgery? A: The average age is around fifty. However there is a great range in age from 30’s to the 80’s. The trend in cosmetic surgery is to start earlier and make small improvements. This way the changes are less noticeable and the healing time is quicker. So over the years I have definitely seen patients starting having brow lifts at a younger age. When to undergo surgery is a personal decision, however, many patients do not realize how much their eyebrows droop because it happens gradually. The body then compensates for the droopiness by holding the eyebrows up using the forehead muscles, resulting in raised eyebrows and forehead wrinkles. In some cases this can result in headaches and fatigue by the end of the day. Please reach out to Sophia, our Patient Coordinator, with your photos and questions, via email at sophia@nyplasticmd.com, by phone at (212) 832-5456 or request a consultations. "I highly recommend Dr. Lattman!! She and her staff are incredible. I saw her upon the recommendation of another one of my doctors after seeking a specialist of ocular surgery to repair a prior seizure-related injury. A few years ago, I had a grand mal seizures at work (I have focal epilepsy) and basically split the right half of my face open from above my right eyebrow down to my cheek. The doctor that stitched me up at the ER was great, but that didn’t prevent the scar tissue from building up and tiny muscle/bone fractures in the area, which caused my eyes to appear asymmetrical. Most people wouldn’t notice, but I look at myself in the mirror every morning and I could see the different pre and post-accident. What seemed minor to most was bothering me on a daily basis, not just for cosmetic reasons, but also because my right eye was tearing out of control. Dr. Lattman took one look at me and saw the same asymmetrical issue I saw every day. She didn’t try to minimize how I felt about it, like most people, and I really appreciated that. A few weeks later, she performed the surgery. I felt no pain during or after the surgery. Upon seeing the results, I started to tear up – with joy – because of how amazing the outcome was. She lined the sutures up perfectly with the crease in my eyelid, so the scaring will be minimal and go unnoticed. Thank you so much, Dr. Lattman!"